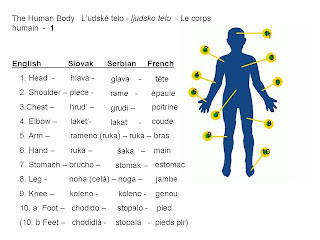 A few days ago Nat, AhoyEnglish sent me this lovely pic with body parts in four languages. Let's listen to Ivan's pronunciation of the words and how they can be used in the context. **Sankao sam se i onda sam pao i povredio ga.(I was sledding and then I fell over and hurt it : 'him' njega = ga = it for Neuter and Masculine Sg. nouns in accusative).